Vernon Vineyards Tasting Room can elegantly seat 50 people for events. Please call or email us to explore how we can help make your next event special. Our picturesque views and gracious accommodations will enhance your next meeting, shower, party, or other special event. We welcome professionally and self-catered events. For larger events, Pedretti's Party Barn is the perfect venue. (See the Pedretti's Party Barn page and photos on this website.) Pedretti's Party Barn is owned and operated by the same staff as Vernon Vineyards Winery & Tasting Room, so we can help you with perfect arrangements. 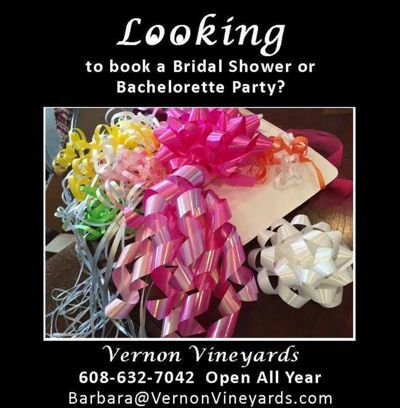 Email: Deanna@VernonVineyards.com or call 608-632-7042. Events sponsored by Vernon Vineyards and/or Pedretti's Party Barn are posted on their respective facebook pages. Please check facebook often. Or, better yet, LIKE our facebook page so you don't miss any events. Some of the events we have hosted include: sip-and-paint, dessert and wine pairing, cheese and wine pairing, musicians, vendor events, major craft and vendor fairs with lunch and beverages, a dinner theatre, book signings, holiday parties for community organzations and corporations, volunteer and customer appreciation events, etc. We welcome your interest in what is happening at Vernon Vineyards. You are welcome to stop by to watch the care of the vineyard, the harvest, etc. We are happy to show you our facilities, discuss the development of cold-climate grapes, share the history of grapes and vineyards in Vernon County, and other related topics. For a formal presentation, please call ahead so we can have staff available, and so that we can tailor our presentation to your needs. Deanna@VernonVineyards.com or 608-632-7042. If you would like hands-on experience harvesting grapes, please send your name and email address to Barbara@VernonVineyards.com and you will be added to our E-notifications when we harvest. Harvesters come when they can, and leave when they must. The harvest is a social and rewarding experience! Page Summary: Vernon Vineyards offers good wine, winery tours, wine events and best wines under 20. Products such as event venue, top red wines, winery tour as well as wine tasting event are also part of the scope of our business. We also specialize in vineyard tours, event barn in West Salem, Prairie Du Chien, Tomah as well as Onalaska. Other areas we serve include Viroqua, Westby, Richland Center and Holmen. We also service Sparta, La Crosse and beyond.